From left to right: Oakland Promise Scholar Albert Mitchell, UC President Janet Napolitano, Oakland Promise Scholars David Luna, Alondra Casillas, Kimhort Lork and Rosario Diaz. At a celebration lunch on Wednesday, Aug. 1, President Janet Napolitano awarded college scholarships through the Oakland Promise to five UC-bound Oakland students in recognition of their academic accomplishments and demonstrated commitment to their communities. In 2016, the UC Office of the President became an active partner of the Oakland Promise, working with the East Bay College Fund (EBCF) to provide need based college scholarships and support to qualifying Oakland students. Oakland Promise Scholars receive scholarships of $4,000 per year, over four years, for their UC studies. 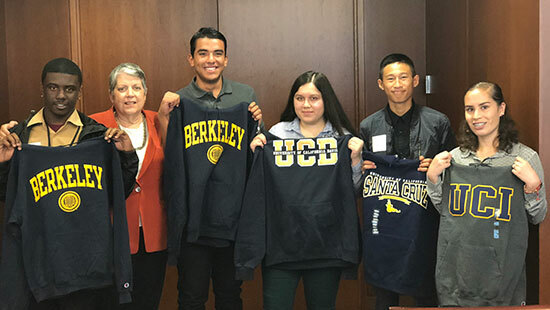 At the event, community leaders such as Oakland Mayor Libby Schaaf and Oakland Unified School District Superintendent Kyla Johnson-Trammell joined Napolitano in congratulating the awardees, and Napolitano presented each student with a sweatshirt bearing the name of their UC campus. Casillas balanced her studies at Coliseum College Preparatory Academy with family responsibilities and community leadership. Alondra has taken every opportunity to prepare for college and beyond – pursuing both a medical internship and a program for underrepresented girls interested in STEM careers. A graduate of Life Academy, Diaz is passionate about becoming a nurse. Rosario worked toward her planned career through an internship with Community Health & Adolescent Mentoring Program for Success and served her community by hosting health fairs at middle schools. In addition to Lork’s academic successes in Oakland High School’s Environmental Science Academy, Kimhort planned student elections and community events as a school leader, motivated his cross country team as their captain, and committed to weekly service in his community. Luna, a graduate of Life Academy, balanced a rigorous course load with a health internship, violence prevention work, and a spot on the cross country team. David is excited to keep working toward his ultimate goal of helping others and making his community and himself proud. Mitchell has been described by his teachers at McClymonds High School as a “math genius.” As a scholar, a member of his school’s football team and a participant in the African American Male Achievement Initiative, Albert strives to be a role model for other young men in his community.